Slip way back in time and ride the ancient Kjolur trail as Icelanders have for centuries. You’ll ride with a herd of loose horses as remounts, as you see some of the most beautiful sights in southern Iceland, before ascending to the glacial highlands of the interior, where you’ll also ride over grasslands and soak in hot springs. The classic Icelandic riding tour! Americans fly out on the night before the tour begins in Iceland. Travelers from Mainland Europe can leave on the same day. Riders will arrive at Keflavik International Airport and then take the Flybus shuttle to the BSI bus terminal in Reykjavik. Luggage can be left here, you can get some breakfast, and it will be very convenient to explore a bit of Iceland’s capital city. Around 5:30 PM, your outfitter will pick up riders at the BSI bus terminal, and take them to their farm in Hveragerdi, about an hour outside of the capital where they can check into the comfortable country hotel. The tour group meets over dinner and are given details of the tour ahead. You’ll go by car to a place near the farm Reykholt in the beautiful area Biskupstúngur. Here, you’ll meet the horses, and enjoy a 4 hour ride, and get used to their unique gaits and qualities. You’ll ride on soft paths until you reach a river which you’ll cross. The tour ends at the farm Kjarnholt, just south of the hot springs at Geysir. 20 km, 4 hrs. You start riding from Kjarnholt and the first stop will be at the enormous waterfall Gullfoss. From Gullfoss you’ll ride into the wilderness, in a black desert of stones and sand, following the river Hvítá west until you get to Mt. Bláfell, 1160 m above sea level, which gives you a beautiful view over Kjölur. You’ll see the glaciers Eyjafjallajökull and Hofsjökull and the volcano Hekla and, on the right, Mt. Hlödufell and the Langjökull Glacier. You spend the night south of Bláfell in the mountain hut, Fremstaver. 35 km, 7 hrs. You’ll ride further east along Blafell, crossing the Hvita River, past the waterfall Abota to the beginning of the Kjolur trail. It’s the oldest road between South and North Iceland, quite flat and about 700 meters above sea level. The view over highlands and glaciers is impressive. You’ll ride along the Svarta River to the hut Arbudir, where the night will be spent after riding about 40 km. in 8 hours. You’ll head off towards Hvitarnes, a grassy area that blossoms with Fifa flowers in the summer’s light. Then you’ll ride through the lava field Kjalhraun, shaped like the keel of a ship, for which the Kjolur may be named. The trail heads into a narrow cleft into the Valley of Thieves, Thjofadalur, hidden behind the mountains. The grass in this lush field is welcomed by the horses! Then it’s up over the mountain named Throskuldur and from there it’s an easy ride to Hveravellir. Your reward for getting there will be a dip in the natural hot spring at Hveravellir. There will be time to explore the area around Hveravellir in the morning, before saddling up. The vast highlands surround you in all directions. Riding past the ruins of the hut of the outlaw Fjalla-Eyvindur you can understand how the highlands were fit only for criminals! After a ride of 28 km, in 5-6 hours, the night will be spent at a mountain hut north of the Galltara River. You continue north over the Eyvindarstadaheidi Moor, and are not very far from civilization in North Iceland. Now the mountains are behind you and the glaciers surround you. On your right is the big lake, Blöndulón, which was made by the power plant by the Blanda River. You’ll continue on soft riding paths and mountain roads, ending up in the green valley Vatnsdalur. 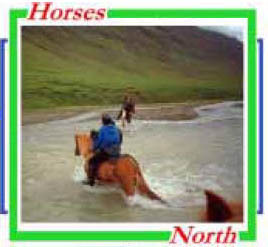 The horses will be left behind, while the riders will head back south to Reykjavik for a last night in a guesthouse. Typically everyone goes out to a restaurant together,(although it’s not included in the price)! The tour officially ends this morning after breakfast. You'll have some time to explore Reykjavik, and then take the Flybus shuttle out to the airport for late afternoon flights. Or, you could take a bus that will take you to the Blue Lagoon for a couple hours before heading on to Keflavik airport. The Kjolur Tour runs 6 times during the summer of 2015. Travel dates are below. Please Note: Some departures of this tour have a reversed itinerary. Below are travel dates — we can arrange for an earlier arrival or later departure. Your arrival day in Iceland is always a transfer day, which allows you to rest from the short night of sleep on the flight before you start riding on the second day. We also have other outfitters who may have other departure dates available for a Kjolur ride. The price* is $4227 p/p, d/o. ( $4438 w/single supplement) includes round trip airfare, with departure taxes and fuel surcharge from NYC, Boston, and Washington Dulles International Airport. (Ask for prices from Denver,Minneapolis, Anchorage, Seattle, and Toronto). Price also includes all transfers while in Iceland, sleeping bag accommodations with shared facilities, all meals, tack and equipment while on the tour, hotel accommodations with private bath pre and post ride nights. *NOT included are travel insurance, breakfast and lunch on the day of arrival in Iceland, dinner on your last riding day back in Reykjavik, lunch and dinner the day of departure and the cost of any extra and additional travels. Accommodations during the Kjolur riding tour are traditionally Icelandic. On your first night you are lodged in the Eldhestar Hotel in comfort, as an upgrade. On the tour you’ll need a sleeping bag and you’ll stay in farm guesthouses, mountain huts and cabins, which are all warm and clean. Typically there are several beds per room,and in huts there may be one big sleeping room. Most will have shared bath facilities. What they lack in creaturecomforts they make up in impressive scenery. Your last night in Reykjavik is also upgraded. This is a 7 night, 8 day tour, and we provide a hotel room for the night after the last days ride. While travel dates to Iceland are flexible, riders from the US must leave for Iceland no later than the night before the tour starts. Riders from Europe may leave home the first morning of the tour.